All our UK baby gifts are sent by a recorded delivery. Our overseas deliveries are sent by various courier companies and International Signed For delivery. Next day deliveries are sent by either Royal Mail Special Delivery - guaranteed to be received by 1pm the following working day or a next day courier service, depending on size and weight. We know that sometimes you want your newborn baby gift to arrive yesterday and other times there is no real rush. That is why we at Rock-a-Bye-Baby Gifts offer 2 methods of posting. We include Royal Mail standard delivery in the gift box price, which means your gift box or baby gift baskets will reach the recipient in approximately 2-5 days. However if you want your baby gifts to get there quicker we recommend using next day delivery. This is a more expensive option and we therefore make an additional charge for this service. Please ensure you opt for this when placing your order. We will be unable to change the delivery method once the order has been placed. Rock-a-Bye-Baby Gift Boxes cannot be held responsible if your new born baby gift does not arrive on your specified day and no refund will be given in this instance. Your choice to purchase assumes the above has been understood. If a baby gift is ordered on Friday and next day delivery is chosen it will arrive on the Monday. This is due to guidelines set by Royal Mail and the courier companies and is out of our control. Rock-a-Bye-Baby Gift Boxes cannot be held responsible if this should happen. 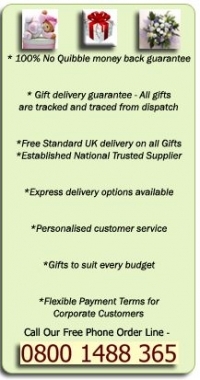 NEXT DAY - UK Baby Gift Delivery: £varies according to gift box weight and price, see table below. If you place your order before 2pm we will post it that day. For all orders received after 2pm your baby gift box will be dispatched the next working day. Working days are Monday - Friday. Note that if you opt for next day delivery on a Friday before 2pm, this will be received by the recipient on a Monday. NEXT DAY SATURDAY - New Baby Gift Delivery: £varies according to gift box weight and price, see table below. If you place your order before 2pm we will post it that day. For all orders received after 2pm your baby gift box will be dispatched the next working day. Working days are Monday - Friday. Selecting next day Saturday at checkout means we will send your new baby gift on a Friday by our chosen method to arrive at any time on the Saturday. We deliver our baby gifts to Northern Ireland and Southern Ireland. Northern Ireland is free delivery. The cost for delivery of a baby gift to Southern Ireland varies according to the price of the baby gift. Please see the table below. We can deliver baby gifts to Europe. Please be aware that this delivery service can take up to 10 days. You will be liable for any taxes or import duties that may become due. If the taxes or import duties are not paid, the gift may be returned or abandoned and we cannot be liable for any costs involved. You cannot combine this service with the Next Day Delivery service. We deliver to these countries only in Europe; Andorra, Austria, Belgium, Cyprus, Czech Republic, Denmark, Finland, France, Germany, Gibraltar, Greece, Hungary, Iceland, Ireland, Italy, Latvia, Liechtenstein, Lithuania, Luxembourg, Malta, Monaco, Netherlands, Norway, Poland, Portugal, Slovakia, Slovenia, Spain, Sweden, Switzerland, Ukraine. The cost of delivery varies according to the weight and price of the gift box, please see the table below. We can deliver to various destinations across the world. Please be aware that this delivery service can take up to 10 days. You will be liable for any taxes or import duties that may become due. If the taxes or import duties are not paid, the gift may be returned or abandoned and we cannot be liable for any costs involved. You cannot combine this service with the Next Day Delivery service. We deliver to the following countries; Antigua and Barbuda, Australia, Bahamas, Bahrain, Barbados, Bermuda, Brazil, British Virgin Islands, Canada, Cayman Islands, Falkland Islands, Fiji, Greenland, Guadeloupe, Hong Kong, India, Israel, Jamaica, Japan, Jordan, Kuwait, Malaysia, New Caledonia, Singapore, United Arab Emirates and United States. Please see the table below for our current prices. Baby gift UK delivery: First class postage is included free of charge and your baby gifts should be received within 2 – 5 days but anything up to 15 days. If you opt for next day delivery (UK only) your baby gift box should arrive the next working day (working days are Monday to Friday) at any time up until 6pm. Overseas deliveries can take around 10 working days. If your baby gift has not arrived in the UK after 15 working days after the estimated date of delivery, we class this as lost in the post and will replace it free of charge. If your overseas baby gift has not arrived after 20 working days after the estimated date of delivery, we class this as lost in the post and will replace it free of charge. Most of our baby gifts are sent in a white gift box. The items inside your gift box will be carefully wrapped in white, pink or blue tissue paper. This service is provided free of charge and makes the recipients baby gift extra special. We do offer gift wrapping where we think it appropriate. We make an additional charge for this service. If any gift delivered is faulty or damaged then we will replace it by either the same type of baby gift or one of similar value if it is no longer available or a full refund will be given as long as the baby gift is returned in its original packaging within 30 days of purchase. If you are not happy with your choice of baby gift or baby gift box then a full refund will be given provided it is returned undamaged and in its original packaging within 30 days from the date of delivery. This does not affect your statutory rights. For further information please read our Terms and Conditions. Occasionally items may go missing in the post. Although we can track an item we cannot guarantee it will arrive in the timescales advised by Royal Mail. They advise that an item can be considered lost after 15 working days after the estimated date of delivery (or 20 working days for overseas mail). If this happens we will replace the item free of charge and track the original through Royal Mail.